This product has been discontinued. Respironics has superceded the M-Series line with the new System One platform. See Related Items at the bottom of this page for a link to the REMstar Plus in the System One platform. 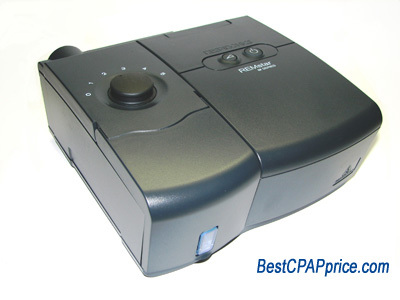 The new Respironics DS100 M-Series REMstar Basic CPAP features the same all-new small and sleek design and patient-friendly functions as the more expensive REMstar Plus and Pro, with the exception of C-Flex and SmartCard capability. The new REMstar M Series family is designed to better fit the patient™s sleep environment and better fit user needs. Simple changes such as moving the patient tubing to the back of the device and concealing the water chamber creates a less obtrusive profile in the bedroom. The simple humidification dial and the three lighted touch control buttons for power and ramp make it much easier to adjust therapy at night. Lightweight device weighs just over 2 lbs. ** Note - Respironics is no longer including the hose swivel adapter with their CPAP machines.